The intent was to prepare dinner for my spouse who worked later than me on Saturday. The dish would have onions and tomatoes in it. Those things I knew. From there the culinary session went into chaos as either I couldn’t make a decision, or more likely, refused to cooperate as I struggled to enter the real world of counter top, sink, stove top and oven. There were knives and heat involved, so it is a miracle the preparation left me unscathed. It began with an onion that was beginning to sprout. Onions are a staple in our kitchen, and we can’t grow or barter for enough of them. Having used up the local harvest, we were on our second bag from the warehouse club. Unexpectedly, one sprouted. Not a catastrophe, and my mind turned toward preparing dishes using onions to eat for dinner and store for later. It would be pizza, chili and/or pasta sauce. That “and/or” became problematic, but no problem with the pizza. A long-time pizza-maker explained that dough makes the pizza. We like it as thin as possible and the recipe is simple: a cup of warm water, a teaspoon of yeast, a scant teaspoon of sugar, pinch of salt and flour enough to bring the dough together in a sticky, but not too sticky ball. Then into a greased bowl in a warm oven, covered by a dish towel for about an hour. It takes practice and over 40 years, I’ve gotten the knack. So far so good. What did I do for an hour? Partly I prepared the toppings for the pizza, including caramelizing two large onions seasoned with basil, made eight ounces of sauce, drained sliced Manzanilla olives and opened the bag of shredded mozzarella cheese I bought on closeout from the local grocer on the way home from work. Caramelized onions on pizza was something we discussed, and Saturday was the night to try them. Using ample bench flour, the risen dough was dumped on the counter, kneaded a second time, then rolled with a pin. For the first time I decided to use parchment paper under the pizza dough to make clean up easier. Initially I hoped to put the pizza-laden parchment directly on the oven rack. I rolled up the flattened dough on the pin and transferred it to the parchment paper, which I laid on a large wooden paddle. The paddle was from the part of the plan where I thought the pizza would go directly on the rack. To call it a plan is not accurate. I transferred the works to a baking sheet. I docked the dough and spread on a thin coating of olive oil. Next the sauce (seasoned with oregano and the remains of a jar of “Italian seasoning” rescued from our daughter’s Colorado apartment), then olives, then onions, then cheese all spread as evenly as possible. 12-15 minutes at 450 degrees and pizza perfection. If I had left it there, everything would have been fine. I got out my kitchen-weary Dutch oven to make the chili or pasta sauce, having reduced the plan from “and/or” to “or.” In my mind, I was making both. Making a rough dice of another onion, I covered the bottom of the pan with tomato juice drained from two quarts of diced tomatoes. The idea was to steam fry the onions. As the juice evaporated, I added more. This part went well and the onions softened, becoming translucent. I added two small cans of tomato paste. Whoever invented tomato paste was brilliant as it both thickens and adds a pronounced tomato flavor to any dish. Here is where things went awry. To season the dish, I added a scant tablespoon of chili powder, some cumin and incorporated everything so I could proceed to the next step. Then I added a heaping teaspoon of basil, which violated some unwritten rule, making the dish neither chili nor pasta sauce. When I seasoned the caramelized onions with basil, while the jar was still in my hand, I unwittingly dumped the rest of it into the nascent chili-pasta sauce. It’s not a crime, but it’s not chili. Once the deed was done, I had to recover. With the chili powder, it would never make good pasta sauce, so I fetched some cans of organic kidney beans from downstairs. I drained and washed them and added them in along with a bag of Morningstar® Recipe Crumbles and covered with more tomato juice. It made nine pints of so-called chili. A fine dinner was and will be had by all as the results of this work are consumed over the next week or so. What the cookbooks by celebrity chefs don’t explain is the foggy dynamic of what actually goes on in a kitchen. Having cooked many meals with my late maternal grandmother, I understand what happened last night is not unusual. The extemporaneous practice of cooking is more often like that than not. Through the haze of a long day’s work we look at life’s deteriorating produce, and a spice shelf where seasonings are older than fresh, and say, “something can be made here.” Even when ideas don’t quite come together in the mist of life, we can sustain ourselves. That is a life worth living. 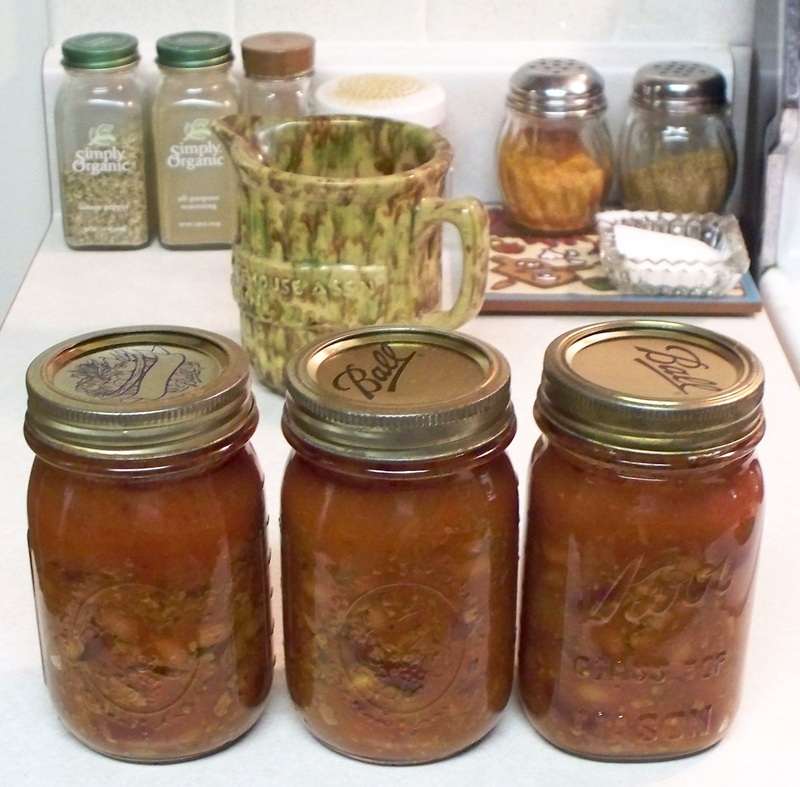 This entry was posted in Cooking and tagged cooking, onions, tomatoes. Bookmark the permalink.